SCHOTT will highlight the many ways it’s helping doctors see better through optics modules, light cables, and image guides at the AAOS 2017 Annual Meeting. The technology company will have experts on hand to showcase its super-luminous light engine - LEDgine 4 optics module as well as SCHOTT® Universal Light Guides, the latest medical light cable made with PURAVIS® fibers, which offer better light output with an environmentally friendly material. In addition, SCHOTT will introduce its new 6 micron re-engineered image guides, which are more robust and flexible than any previous image guide. All will be on display at SCHOTT’s booth, #1015, from March 15-17. The SCHOTT LEDgine platform has been specifically developed for the most efficient coupling of LED light into small-size fiber optic bundles. The small footprint of the module allows for easier integration into end-users systems, which is particularly useful for medical applications, where smaller light guides with active diameters from 3.0 to 5.0 mm are commonly used. 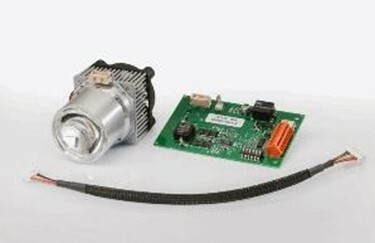 The encapsulated LEDgine optics module, containing LEDs and focusing optics, has an integrated fan to ensure optimum cooling. Its separate control electronics monitor the LEDs for overheating, ensuring a long lifetime for the system. Driven by constant current, the light intensity of the LEDs can be continuously dimmed between 0 and 100 percent while remaining flicker-free. The external triggering option can make fast movements visible, like those of vocal cords. SCHOTT® Universal Light Guides will also be on display. Made with PURAVIS® fibers, this latest medical cable provides up to 8 percent more white light, superior longevity, autoclaving stability, and low solarization. For use primarily in endoscopy applications, these new fibers deliver more natural color rendering, low attenuation in the visible range, and very low dispersion. Debuting at the AAOS show, the new 6 micron fiber optic image guide improves flexibility and offers a higher resolution due to its smaller fiber size. It features a larger active area for increased visibility and superior image quality with zero optical inclusions in the center zone.